Hi. I am teacher Rubi. Welcome to native camp. I am here to help you learn English in fun and enthusiastic way. I am a friendly and a patient teacher. After our class, you can expect that you can learn new things and you can speak English in a better and in a confident way. See you in one of my classes. Have a great day. Teacher Rubi got a baccalaureate degree of Bachelor in Secondary Education specializing English. 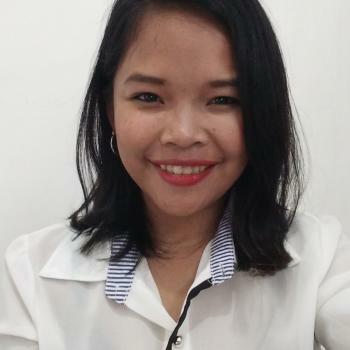 She has been hired as an ESL teacher at Global Vision English Academy teaching Korean students last 2014. On August 2015- April 2017, she has been hired as a college instructor teaching English subjects at Palompon Institute of Technology. And on June 2017 to present, she's been hired at Department of Education as public teacher. She is teaching senior high school students with English subjects like Practical Research and Literature subjects.. Currently, she is the research coordinator and immersion coordinator of her school. Teacher Rubi is a solo parent and she is dedicated to work overtime to provide the needs of her kids. She is also a dancesport enthusiast in a Latin category. She goes through a lot that is why, she believes that success depends on how you handle your failure. And success can't be measured with how intelligent you are, but on how you cope with your failure. Thank you for the enjoyable class!